Seemed like a good idea at the time and it will be in the long run but getting there might kill me. We usually don’t embark on large projects in the middle of the season because there is too much danger in having to stop and take care of the growing stuff and then not getting back to the project for some time. 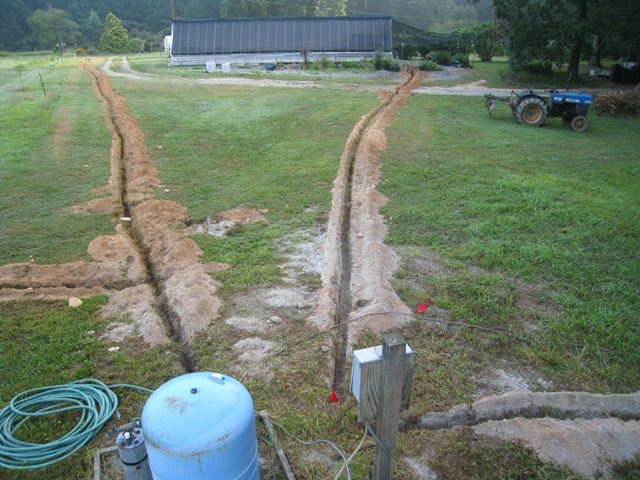 Faced with a rare situation of being caught up with the daily chores and really not having anything for the staff to do for several days we decided to finally tackle the installation of a bunch of new water lines around the farm. The background here is that the water for the packing shed and the greenhouse runs over 600 feet, across the field, from our house well on the “other side” of the farm. We had always talked about maybe drilling another well over near the “working” buildings and finally in the historic drought of 2002 we had to drill a new well just to have enough water to irrigate with. All of a sudden there was water pressure we could only dream of from that new well. The little three quarter inch line we had run from the house just couldn’t produce that kind of volume and pressure. So for seven years we have run hoses from the well head to water the greenhouse, the turkeys and to water in new transplants in the field. Time to permanently bury some water lines to freeze proof hydrants and eliminate the endless hoses. Now burying things around here is no simple task because we have stuff buried all over the place, irrigation head lines, phone lines, power lines, water lines, electric fence lines. It is going to take master map reader, a gps, a Geiger counter and a truffle sniffing dog to find everything here once I die! So first we had the utilities located and I essentially new were all the water and irrigation lines are buried but we had to do some careful exploratory digs to find them. First thing yesterday I went and rented a walk behind trencher and was waiting when Cov and Glenn arrived to get started. While they gently dug around all obstacles (seven in all) and did other shovel work I ran the beast. Six solid hours and 800 feet of trench later I was whipped! Every road and field on the top part of the farm is now blocked, so today we have to get all the piping in and buried so we can return to normal duties tomorrow and before it might rain and make the whole thing a mess. It won’t mean running water quite yet but the heavy lifting will be done and in my leisure I can finish up all the connections to the well, that is if I can still lift my arms over my head!